Dani Carvajal has described sacked Real Madrid manager Julen Lopetegui as the best coach he has had in his career. Lopetegui was dismissed by the European champions last week in the wake of a 5-1 mauling at the hands of Barcelona in El Clasico. 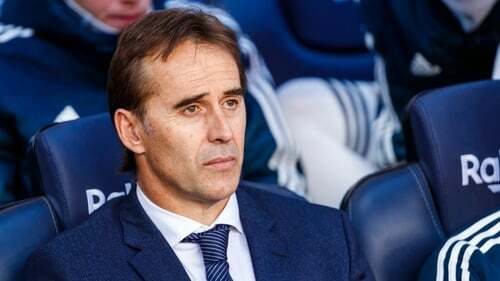 While Real continue their search for Lopetegui's successor - reserve-team boss Santiago Solari has been placed in temporary charge - Carvajal has come out in support of his former boss with club and country. "For me he is the best coach that I've had. Unfortunately he hasn't had that smidge of luck with us," said Carvajal, who has played under the likes of Carlo Ancelotti, Zinedine Zidane, Vicente del Bosque, Luis Enrique and Rafael Benitez. "His way of seeing football, his way of managing the group, his way of being with the players, is something that I share, it's my idea of seeing football. "I said it before he became Real Madrid coach, I'm saying it now he's no longer with us and until I find another coach who, for me, is better than him, I'll continue saying it." They are still seven points adrift of leaders Barcelona, but full-back Carvajal warned: "Madrid always come back." He added in an interview with TVE: "We're not going through a good moment, that's clear, but we also struggled at the start of last year and ended up winning a third successive Champions League, which is something historic."